As guest speaker at the Ocracoke School Academic Awards Banquet last week, Angie shared how hard work, perseverance, belief, imagination, and really really wanting something helped her achieve her goals. Angie's a local business owner, wife (to Andy), mother (to Catherine), community volunteer, and member of the Hyde County School Board. She helped organize Ocracoke's Race Weekend in April. She's also an elite athlete who qualified this year for the Boston Marathon, which just happened to be record-breaking in terms of lousy weather and drop-out runners. I sat down with her for an interview earlier this month so she could tell me about the wind and weather in Boston on April 16th. On the morning of the Boston Marathon, the weather looked less than ideal. The dark grey sky, cold wind, and heavy rain created uncomfortable conditions as the runners congregated at the starting line. As the race date had approached, Angie checked the weather regularly. The outlook from the get-go wasn’t super, with the wind forecast to be anywhere between 15 and 29 mph. By the time the race began, the wind was blowing at a steady 25mph. When she awoke the morning of the race it was windy, but dry, so even though conditions weren’t optimal, they weren’t terrible either. She had her normal race gear, plus a waterproof paper covering that can be ripped off easily. Before loading the bus that would take her and other runners to a nearby school, she exclaimed to Andy that she wouldn’t need to take her throwaway covering. Of course the weather changed, but once the runners load the bus to get to a nearby school, it’s too late to turn back. By the time she arrived at the school, she was soaked and regretted not bringing her throwaway covering. “There was snow on the rooftops, mud everywhere, rain, and 30,000 people going through that area. It was the sloppiest mess you’ve ever seen,” Angie said. Boston sends out preparatory messages to all the runners before they arrive in the city. Participants are encouraged to pack an extra pair of shoes to wear as they make their way to the starting line and change into their running shoes once they’ve arrived. The runners have to walk through a grassy field at the school, which under better conditions would have been fine. Due to the rain and sheer number of people walking across the area, the field was turned into a massive mud pit. Everyone was covered in mud, but they were at least able to change into dry shoes before the race began. Well, their shoes were dry for a few minutes anyway. As the course comes to the end, there are two iconic turns: one to the right the next to left. “As I made that first turn I heard someone yell, ‘One more turn and you’re there,’ which was kind of nice, so then I made that left turn and saw the finish line as well as the clock at the finish line,” she said. She knew the clock time, which is known as “gun time,” was based off her wave, not the “bib time,” which is based off chip readings taken at various points during the race. Chips are implanted into the numbered bibs worn by each runner, so sensors can track each runner’s progress. Her time was nearing 4 hours, and she was bound and determined to cross the finish line before the 4-hour mark. “I saw the clock was at 3 hours, 50-some-odd minutes; I knew it was getting close to 4 hours, and I said I need to cross that finish line before that clock hit 4 hours. And we’re only talking about 2/10th of a mile; we’re talking about nothing. But after 26 miles, that particular 2/10th of a mile seemed like an eternity, like a marathon all in itself.” She wondered if she was ever going to cross the finish line, as it seemed to get farther and farther away. What a coincidence! Angie's 1st 1/2 marathon also happens to be the first photo the Ocracoke Current ever posted on our Facebook page! 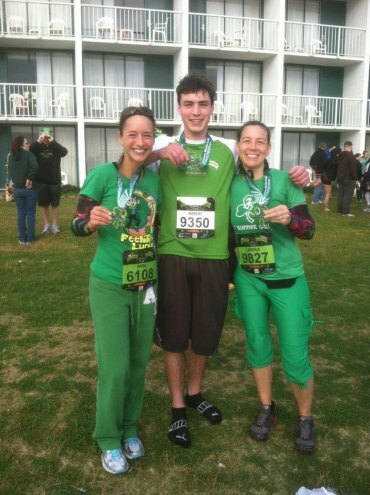 Sara Clark, Emmet Temple, & Angie Todd at the Shamrock 1/2 marathon in 2010. Angie will run the Boston Marathon again, hopefully in better weather so she can enjoy the city and race. “All I asked the universe for was no wind, and it gave me a crazy headwind and rain. It was an out of body experience. I ran Boston, but I wasn’t there at the same time," she said. She hopes the next time she runs America’s oldest and most prestigious race the weather is a bit more cooperative so she can really experience it, be there, and enjoy it. Angie also has her sights set on running the London Marathon in 2019, which falls around the same time as the Boston Marathon, which she plans to run again in 2020. Angie doesn't only work on her own fitness and running skills. Her devotion to encouraging those around her to exercise and reach their physical fitness goals remains unwavering, and several years ago she opened Angie’s Gym. The full service facility offers classes as well as weight machines, free weights, and a variety of treadmills, elliptical trainers, and a row machine. She and her husband Andy Todd have been running half and full marathons for several years, but her interest and commitment to exercise began at her home. She became certified after a few months and in 2009 began offering the class for free at the Community Center. Her first class had nine attendees, but after finding scheduling a challenge due to other events being held at the Community Center, she thought, “I want a studio that’s my own that’ll hold eight to 10 people.” Then she thought, “If I’m going to make that kind of space, why not make a space for people who don’t do Turbo Kick, for those who want to do something else?” Soon, that thought morphed further into, “Why don’t I build a whole gym?” She describes the gym being a total accident, saying she never went into this thinking she would build a gym on Ocracoke. Angie also said for a long she was mad that Ocracoke didn’t have a gym. Laughing, she said, “I thought if Ocracoke did have a gym I’d have somewhere I could teach Turbo Kick.” Then she realized she could fix this by building her own gym. Angie’s Gym was built in 2012 and has become a highly used and accessible place for exercise that offers a variety of work out options. She describes her journey to running the Boston Marathon in much of the same way the gym happened: as an accident. In 2011, Angie’s best friend, Susie Kennedy, ran the Shamrock Marathon in Virginia and suggested that Angie train to run a half. Angie agreed, but had a hard time imagining herself completing the 13.1 mile run. Angie ran it, but did not love it. After crossing the finish line said she wasn’t going to do that again. “There was not one thing about it that I loved. Finishing I kind of loved, and I kind of loved the idea that I could finish a half marathon, but I don’t like running, that’s clear,” she said. Then, in 2014, Andy said he’d like to run a half marathon, so she began training with him. She explained that training is scheduled running, which depends on slowly progressing. Through the week short runs are completed, followed by long runs on the weekends, for example. Mileage is slowly added to the runs, but runners often don’t run a whole half or full marathon before the actual event. “Most half marathon training programs cut you off at 11 miles, and the same thing is true for full marathons,” she explained. Her long runs before the Boston Marathon were 18 miles, done four times before the race. So she and Andy did the Crawling Crab half-marathon in Hampton, Virginia. “I only did it for the beer because there was a beer festival at the end,” she said. They both ran it and Angie said she had a great time because the course was fun, the announcer was funny, and the crowd was happy. They’ve run the Crawling Crab half-marathon since 2014 and plan to continue running it every year. In 2016, she ran the Richmond marathon, where she qualified for the Boston Marathon for the first time. This was also the first time she had set her sights on competing in Boston. She qualified for Boston with a time of 3 hours, 41 minutes. Then, in 2017, she traveled to Canada to run in the Niagra Falls marathon. She remembers it being a horrible experience due to extreme heat and being dissatisfied with her personal performance. Having already qualified for the marathon, she began to doubt her “deservingness to run Boston.” She describes how she beat herself up for quite a while after that race, but knowing she could do better she began looking into more races. She also signed up to compete again in the Niagra Falls marathon in October of this year. She ran the very first Carolina Brewfest race in High Point, North Carolina, where there are lots of hills, yet that is where she ran her fastest half-marathon up to that point. “That’s when I starting thinking I might be good at this, that I could be a runner,” she said, “So then I started trying harder to do better and better and better.” Her fastest half marathon time of 1 hour, 38 minutes was earned in Oxford, England. She came very close to beating her time in Oxford during the Tobacco Road half marathon in March of 2018, in Cary, North Carolina. The Tobacco Trail, which used to be train tracks with very long and slow inclines and declines, is also where she ran her first full marathon. She ran it by chance taking Andy’s place when he was unable to compete due to injury. She ran the race in 3 hours, 38 minutes, which is to date her best time for a marathon.